Congratulations to Westmead’s nursing graduates. L – R front row: Westmead director of nursing & midwifery Kate Hackett with registered nurses Rachel Cavanagh, Layla Youssef, Niketa Sriwastav and Ayan Ali. Back row: Registered nurses Stephanie Cashmere, Rey Dizon, Chloe Nanai, Rachel Sutton, Michelle Jurd, Holly Malpass and Scott Devoy. 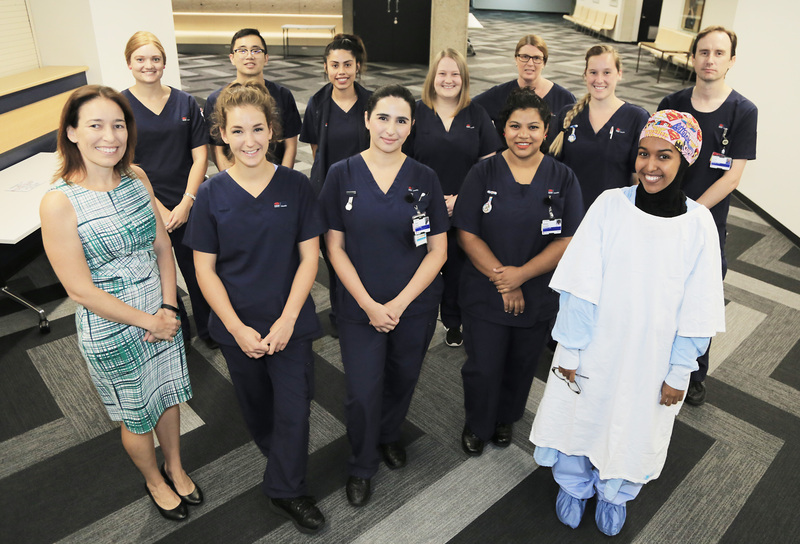 More than 45 Westmead Hospital nurses are excited to be completing their 12-month Transition to Professional Practice Program next month, also known as their graduate year. The Transition to Professional Practice Program offers nurses and midwives the opportunity to work in various WSLHD hospitals while supporting their journey to becoming a registered nurse or midwife. The program is supported by senior clinical multidisciplinary staff, unit based clinical nurse educators and a supportive network of nurse educators. Westmead Hospital’s director of nursing and midwifery Kate Hackett congratulated the health professionals who will retain positions at the hospital. “I congratulate these nurses who are undertaking the Transition to Practice Program. It’s an exciting step in their career. These nurses will continue to be at the frontline of patient care working in all areas of the hospital including emergency, surgical, medical and critical care at Westmead Hospital,” Kate said. For further information about the WSLHD Nursing and Midwifery Transition to Professional Practice Program, email WSLHD-TPP@health.nsw.gov.au. Westmead nursing graduates registered nurses Layla Youssef, Ayan Ali and Scott Devoy.